It’s Friday and I’m bagged. Week 1: A brief history. Grab a coffee or tea and join us each Friday to learn how these Soak worthy bags came to be. Are you bagged? Send us your favorite bag. If we feature it here, we’ll send you a Soak gift pack, in a pretty bag, of course! When I was little, my mother travelled the globe. She was a fashion designer. She frequented New York and Los Angeles, San Francisco and Montreal. She bought fabric in Asia, shopped the stores of Paris and London and visited suppliers world-wide. 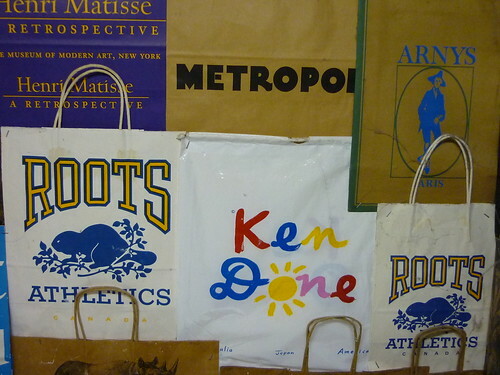 She also collected shopping bags from boutiques near and far. Many moons ago, she used them to wallpaper the basement of the house where we lived. Paper bags and a staple gun. History in the making. She loved the prints, the colours, the sayings and, I’m certain, the shopping that went along with them. Many bags are from boutiques that no longer exist, or stores that have changed their name, logo and image, time and time again. 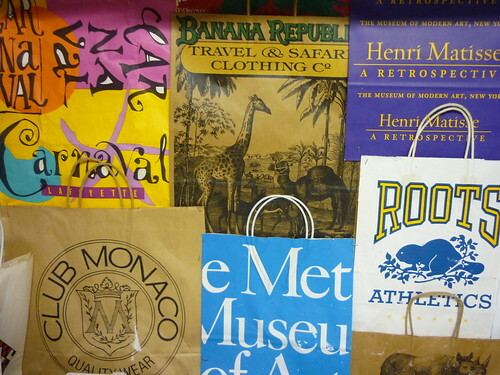 Did you know that Banana Republic used to be a ‘Travel & Safari Clothing Company’? (I miss those old Banana Republic t-shirts with lions and tigers and bears, oh my!) Club Monaco is a great Canadian brand of the past. Roots is still around with its iconic beaver et al. Remember Ken Done with those great water colours and prints? I guess that’s where my fascination for bags began. Where we live, in the city of Toronto, Canada, there’s a new bylaw that states that retailers must now charge a minimum of $.05 for a plastic bag. This trend towards re-usable bags has created a larger than life collection of brilliant bags at our office. We now travel the globe, attending trade shows, visiting customers and of course, shopping. While our bag collection is often used for carrying Soak to and from the office, some of our bags are becoming icons in their own ways.Each Friday we’re going to share part of our bag collection with you. You’ll learn about bags from our distributors, Soak retailers, events we’ve sponsored and places we’ve been. We’ll include fascinating facts, merchandising tips and whatever else we find in the bag. So sit down, grab a coffee or tea and join us each Friday to learn how these bags came to live at our office.